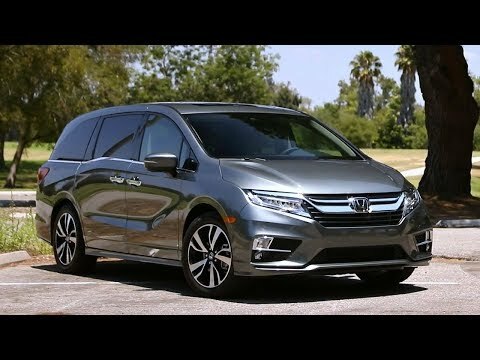 Enjoyably easy to drive, nicely appointed inside, and boasting a long list of clever new features and tech, the all-new, 5th-generation 2018 Honda Odyssey isn't just the best minivan on the road, it's the best family car ever. What I love about my 2018 Odyssey Honda It is great for road traveling. I like the spacious cabin. It is bigger than previous models. The 2018 model comes fully equipped even with Wi-Fi capabilities which my kids love. I do too because I can do work sometimes in my car. I also enjoy the navigation system. Oh! And the cabin talk is awesome. I can now talk without having to scream to all passengers in the vehicle while driving or when we need to pick up orders from the drive thru. I can now easily ask everyone in the car what they like with no screaming all the way to the back. The body of the vehicle is longer than previous models which takes a bit more space in my driveway but it is ok. I like it. This model has sensors everywhere to prevent crashes. If it gets too close to a vehicle in the front in flashes you to break. Also, the vehicle breaks automatically to prevent accidents. The performance is good but it could use more power. Even though this model is the first one of the Odyssey collection that came out with 10 speeds which is great on the high ways, it still lacks some power while driving in the city. Finally, one thing I am not too happy about is that it consumes a lot of gasoline. It is my only regret about buying this vehicle. Other than that I am very happy with it and my children too!! All you need in a car if you are a family with kids. Even if you do not have kids. The Honda odyssey looks really nice considering it is a minivan the way it is design. The third row seating is very roomy and have plenty of legroom and you are able to adjust the seat as well. Love the feature of being able to slide the middle row and make different configuration to your need when the middle seat is remove. This makes it ideal when you have kids especially little ones. I wish the did and open to stow away the middle seat just like the Pacifica so that you do not have to take the seat out in the event you need extra storage and do not need the middle row. For the x ex-l with rear entertainment system. Wish they would put the “TV” on both the left and right hand side instead of just 1 in the middle. Makes it kind of awkward to watch when you are seating on the left / right hand side. Especially if you are sitting in the middle row since it is close to the “TV”. The line assist and drive assist is a nice feature that Honda have added especially if you commute or when you do long drive for vacation etc. A vehicle made for families. I love my Honda Odyssey. The best features are the four sliding doors, automatic trunk opening, captains chairs that slide and the blue ray player. It comfortably fits 6-7 people and can fit 8 for shorter rides. The sliding captains chairs make it incredibly easy to help kids in the third row buckle in if possible. This car would be a great choice for anyone with kids and is one of the only cars I know of that can easily get four car seats and allow and adult to buckle everyone up. The blue ray player comes with two wireless headphones and has 2 headphone jacks so the driver does not have to listen to movies. Also the trunk is so much roomier than SUVs and allows a family to travel with their luggage. This car also has a good amount of power, I honestly feel like I got everything I wanted and needed in a car for my family.